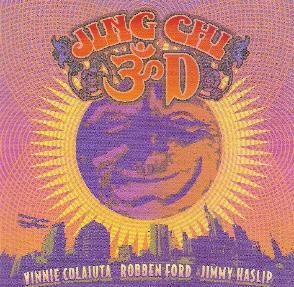 This is the third CD by this trio of Robben Ford, Jimmy Haslip and Vinnie Coloiuta. I quite liked the bands debut CD but I did not hear the Live at Yoshi's release from 2003. This CD is for sure the heaviest thing the band has ever released. It opens up with the heavy bluesy rocker, "Colonel Panic". It is cool to hear Robben play guitar like this. "Chi Town" and "Move On" are pretty laid back tracks like on the first CD. "Hidden Treasure" is a 7½ minute number with amazing bass playing and a real classic jazz fusion style guitar playing. "Time is a Magazine" is another heavy riff for this band. While the biography compares this CD to stuff by Led Zeppelin, Cream, and Band of Gypsies, the sound is far too clean and not really rocking in the way the bands mentioned did. Now the CD heads into a blues direction. "Mezzanine Blues" is blues but in a jazz style. I don't know how else to explain it. "Blues Alley" really takes it down to a slow mellow pace with some nice keyboards in the background. "It's Nobody's Fault But Mine" is one of the highlight on the CD, featuring guest guitar and vocalist, Robert Cray. This track lasts 14 minutes and gives everyone time to get into the groove and show off a bit! A wah wah riff takes off to close the CD with the hard edged "Tangled Up". A very impressive CD with amazing playing by all musicians and the bands best yet!